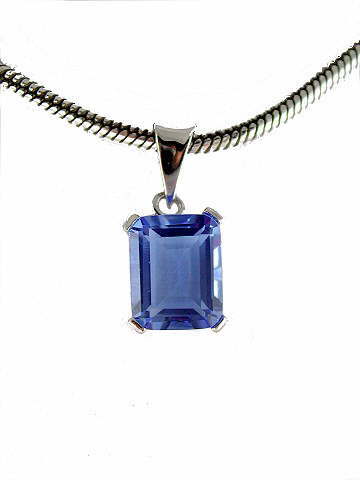 Beautiful small emerald-cut Siberian Blue Quartz pendant. This is speciality quartz, which is lab-grown. Genuine Siberian Quartz crystals are collected and then grown in controlled conditions in a laboratory and infused with cobalt, which gives them their exquisite blue colour. This process produces completely flawless and pure blue Quartz. Metaphysically, these stones are said to be powerful carriers of the 1st or Blue Ray, which is related to both the throat and third eye chakras. It is said to embody the qualities of inner vision, clairvoyance and other psychic abilities. Archangel Michael is Master of the 1st Ray - the Blue and White Flame. The keywords associated with this ray are: Protection, Faith, Will of God, Power, Perfection, Motivation, Courage and Direction. ‘Siberian’ in gemology terms is often applied to gemstones of a flawless nature and of the and highest AAA grade. Set in rhodium-plated 925 sterling silver.